Quadrant Knowledge Solutions’ recent study “Market Outlook: Internet of Things (IoT) Platform, 2018-2023, Worldwide” analyses market dynamics, growth opportunities, emerging technology trends, and the vendor ecosystem of the global market. Quadrant Knowledge Solutions conducted an in-depth analysis of major IoT Platform vendors evaluating their platform capabilities, ecosystem strategy, market presence, and overall value proposition. The evaluation is based on primary research with expert interviews, analysis of use cases, and Quadrant’s internal analysis of the overall IoT platform market. The research also provides a detailed competitive analysis of the primary IoT platform providers, including Actility, Axiros, Ayla Networks, Carriots (Altair), Cisco, Cumulocity, Eurotech, Exosite, IBM, Microsoft, PTC, SAP, Sierra Wireless, Telit, and others. Presently, IoT platform market is in emerging stage, with the presence of multiple vendors offering varying degree of IoT platform capabilities. Depending on the target market and application segments, these vendors are helping enterprises in supporting their digital business initiatives. Most of these vendors have limited capabilities and are focusing on their specific market segments. However, driven by tremendous growth opportunities, vendors are continuously expanding their offerings through in-house developments and strategic acquisitions. Presence of several IoT platforms with varying degree of capabilities is expected to drive large scale acquisition and collaboration to complete their solution portfolio. Several leading IoT platform providers are adding capabilities, such as augmented reality (AR), artificial intelligence (AI) and cognitive intelligence to improve competitive positioning and their solution performance. In addition, vendors are also expanding their partner ecosystem to accelerate the value and overall performance of their IoT platform offerings. As part of the research, Quadrant’s competitive landscape analysis compares vendors’ technological capabilities in providing IoT platform and services in terms of performance parameters of technology excellence and customer impact. Performance in technology excellence is measured by parameters, including sophistication of technology, technology application diversity, scalability, competitive differentiation, and industry impact. Customer impact includes parameters, such as addressing unmet needs, product performance, proven records, ease of deployment, and customer service excellence. According to the research findings, ThingWorx from PTC, with its complete, end-to-end and purpose-built platform for industrial IoT, is positioned as the 2018 technology leader in the global IoT platform market. advanced analytics, machine learning, augmented reality, and integration with leading device clouds. These functionalities enable businesses to securely connect assets and create innovative applications and services supporting digital transformation initiatives in a variety of industry applications. ThingWorx’s capabilities are a result of its technology innovation and strategic acquisition of key IoT technology by PTC. The platform’s capabilities combines application development from ThingWorx, communications connectivity to industrial equipment from Kepware, IoT connectivity and device management from Axeda, machine learning and predictive analytics from Coldlight, and augmented reality from Vuforia. ThingWorx is well positioned to transform the way smart, connected products are created, operated, and serviced. ThingWorx IoT platform promises to deliver a complete set of IoT-specific development capabilities for making solutions more powerful and enabling quicker time to market. ThingWorx features includes ThingWorx Foundation, ThingWorx Analytics, ThingWorx Studio, ThingWorx Industrial Connectivity, and ThingModel. ThingWorx Foundation is a ready-built IoT development platform that enables developers to rapidly create, test, and deploy enterprise-ready industrial IoT solutions. ThingWorx has one of the largest ecosystem of partners to accelerate IoT initiatives of enterprises and leverage pre-integrated products and extensions by solution providers. It also ensures security leveraging PKI infrastructure for certificate validation, and granular security model with role-based access configuration for business users, administrators, and developers in developing secure solutions. ThingWorx Foundation includes Application Enablement Platform (AEP), a design and runtime engine, that enables rapid development and deployment of applications with the help of ThingModel. ThingModel is a true digital representation of a physical objects, that simplifies the delivery of application and experiences. AEP also offers an intuitive user interface and a drag-and-drop functionality to enable rapid creation of applications without the need for coding. ThingWorx Foundation also offers connection services, software agents, and toolkits to enables flexible connectivity options to maximise market opportunity and minimise integration efforts. ThingWorx Analytics automates complex analytical processes and uses sophisticated artificial intelligence and machine learning technology to delivers real-time operational insights, real-time pattern and anomaly detection, outcome-based predictions, prescriptive insights and contextual recommendation to ThingWorx-powered IoT solutions. It also includes digital simulation capability, within the applications, to simulate the behaviour of physical products in the digital world. ThingWorx Analytics is designed to overcome the challenges associated with handling a wide variety and volume of IoT data. With user-friendly interfaces, visualization, and tools, it eliminates the need for in-house developer or technical expertise in data analysis. Vuforia Studio simplifies the creation of augmented reality experiences with its efficient and easy-to-use authoring tools that transforms applications and objects into immersive experience. Recently rebranded from ThingWorx Studio as part of the Vuforia AR platform, Vuforia Studio provides composite view of digital and physical product data, dashboard, and alerts presented in 2D, 3D, and augmented reality without requiring any coding. PTC’s unique capability of incorporating AR and immersive experience into IoT platform help enterprises in improving customer experience, services, and operations. Industrial companies can significantly improve the engineering and manufacturing of products. ThingWorx Industrial Connectivity, powered by Kepware technology, provides complete solution for industrial device interoperability. With its single intuitive user interface, It enables users to connect, manage, monitor, and control disparate automation devices and industry software application. ThingWorx Industrial Connectivity supports over 150 device drivers, client drivers, and advanced plug-ins; and leverages OPC and IT-centric communication protocols to provide seamless connectivity of plant floor ecosystem with all aspects of the enterprise. This helps in creating enterprise-wide visibility from shop floor to the top floor for improved decision making. ThingModel connects and unifies all the components of ThingWorx platform, including Foundation, Analytics, Studio, Industrial Connectivity, and layers of the technology stack. ThingModel provides a digital representation of physical assets, persons, organizational elements, or work processes. It enables the rapid creation of IoT applications leveraging real-time, bi-directional connectivity to ‘things’. IoT platform is set to transform industry and infrastructure by new business models with enhanced connectivity, intelligent insights, collaborative work processes, and industry convergence. IoT platform is providing organization with the necessary tools and technologies in developing their unique industry-specific applications to drive next generation of productivity improvements. Quadrant Knowledge Solutions recommend industrial companies to evaluate key IoT platform capabilities in terms of integration, device management, application enablement, rapid development, analytics and data management in-line with their digital transformation roadmap. Users should also look for IoT platform vendors with industry-specific expertize and a history of successful large-scale deployments. Users should carefully analyze existing case studies from multiple industry applications. This should form the basis for preparing and leveraging best-practices for IoT solution developments and deployments. 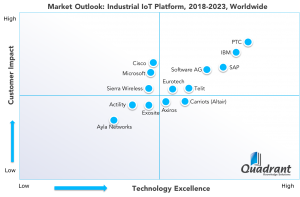 According to the Quadrant’s research findings ThingWorx, with its sophisticated technology platform, application diversity, competitive strategy, and high customer impact, is recognized as the 2018 technology leader in the global IoT platform market. The company, with its most comprehensive industrial IoT platform with unique capabilities of rapid application development, advanced analytics, augmented reality, and integration with leading device clouds, is well positioned to help end users to realize the true potential of a smart, connected enterprise.